Hummingbirds display exquisite aerial shows that no other birds can imitate. Their anatomical advantage allows them to maneuver their tiny bodies in such intricate ways, like those of an Olympic gymnast; they are able to fly backwards, belly up, and make swift, agile movements during flight. All these unique motions are results of the hummingbirds ability to hover. What differentiates hummingbirds from all the other species of birds is their ability to produce lift via up-strokes. 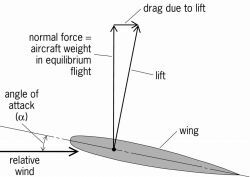 In “average” birds, 100% of the lift is resulted solely from the down-stroke. The structure of their wing makes it impossible to create adequate force to overcome gravity from the up-stroke; birds can only flap up and down, arc, and fold their wings. Thus, the main objective of the recovery stroke is to create the least amount of drag and negative thrust that will counteract the lift being produced. On the other hand, hummingbirds distribute their generation of lift between the down-stroke and up-stroke. The down-stroke supports 75% of the weight, leaving the remaining 25% to be compensated by the up-stroke. Their wings are capable of twisting, creating a beneficial angle of attack in both directions. Even though the up-stroke isn’t as efficient as the down-stroke, the constant generation of lift allows them to precisely hover in any part of the atmosphere. 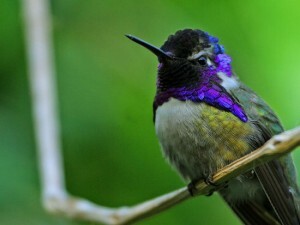 The quality of lift during up-strokes can be over looked because of the hummingbird’s rapid flapping. They are able to go through 500 wing beat cycles in one second! The combination of twisting wings and unbelievable flapping speed allows the hummingbirds to execute precise and unconstrained movements. Hummingbirds are also unique in the way they use their tail. In addition to using them as a steering and speed controlling mechanism, they are used for mating. Male species perform high speed dives, reaching up to 50mph. As the male hummingbirds descend, they naturally create a “song”, differing depending on the specie. The signature sound produced is altered by the position and shape of tail feathers. Ultimately, it is the vibration, caused by the feathers cutting through the wind, that initiates the beautiful song male hummingbirds sing for their mate. It is truly amazing how such a small creature can be so phenomenal. The tail feather noise is pretty cool. I always thought the hummingbird noise came from their vocal chords (if they have any). Haha I was about to do it on this topic actually! I found an article over it, pretty cool BNam! But yeah I think that’s awesome how they can create sound just by their tails.